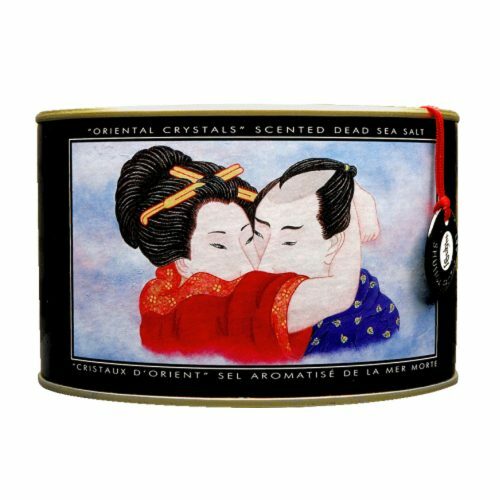 An evening of caresses in the shower or bath can only be enhanced by this shower gel made with vegetable oil and vitamin E. Its subtle flavor awakens the senses and leaves no aftertaste – Great for kissing. Directions: Pour a small amount of shower gel onto a bath sponge or washcloth, dilute with water and work it into lather. For great tasting bubbles dilute the gel with water. Ingredients (I.N.C.I. ): Demineralized water/Eau déminéralisée (Aqua), Sucrose, Sodium lauryl ether sulfate, Glycerin/Glycérine, Sodium lauryl sulfate, Cocamidopropyl Betaine, Almond oil/Huile d’amande (Prunus amygdalus dulcis oil), Grape seed oil/Huile de pépin de raisin (Vitis vinifera seed oil), Avocado oil/Huile d’avocat (Persea gratissima oil), Sesame oil/Huile de sésame (Sesamum indicum oil), Safflower oil/Huile de carthame (Carthamus tinctorius oil), FRUITS: Flavor/Saveur (Aroma), MINT/MENTHE: Peppermint oil/Huile de menthe poivrée (Mentha piperita), Sodium benzoate, Citric acid/Acide citrique, Sodium chloride, Vitamin/Vitamine E acetate (Tocopheryl acetate), Aspartame, Aloes vera (Aloe barbadensis), Colors/Couleurs: FRUITS: FD&C Red/Rouge #40 (CI 16035), D&C Red/Rouge #33 (CI 17200). MINT/MENTHE: FD&C Blue/Bleu #1 (CI 42090), FD&C Yellow/Jaune #5 (CI 19140). This product contains 2 sachets. Empty sachet #1 into bathtub, already half filled with warm water. As you lightly stir, within 5 to 10 minutes, water will turn to an unctuous pearly gel. A few minutes before stepping out, pour the sachet #2. Lightly stir the gel for a few minutes so that it returns back to water. 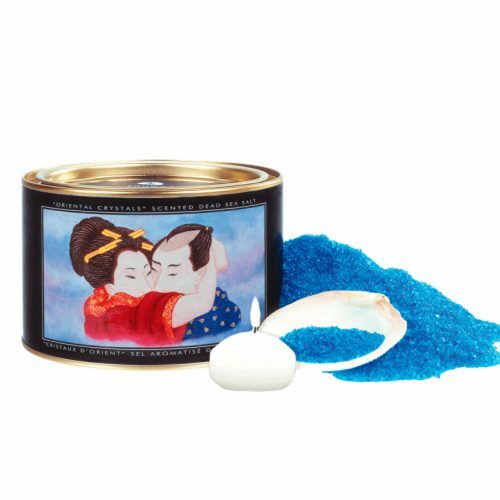 Use these aphrodisiac bath salts, velvet bubbles, sky blue water and mood-setting candle to create an oasis of relaxation. Directions: Pour one or two scoops of the Dead Sea salt using the sea shell in your bath tub. Light the candle and let it float on the water. Enjoy this relaxing bath! Ingredients (INCI): Dead Sea Salts/Sels de la mer morte (Sodium chloride), Sodium Lauryl Sulfate, Sodium Dodecyl Benzoate Sulfonate, Fragrance, Glycerin/Glycérine, Safflower Oil/Huile de carthame (Carthamus tinctorius oil), Almond Oil/Huile d’amande (Prunus amygdalus dulcis oil), FD&C Blue/Bleu #1 (CI 42090).